Jesus' arrest was yet another event in a series of despicable human acts leading up to Jesus on the cross. Christ teaches us an incredible lesson in the olive grove - love thy enemy. Please read John 18:1-12 before starting GraspingGod.com's free Bible study lessons, #3.06. Previous lesson: Judas' Kiss #3.05. 1) Was a miracle performed during Jesus' arrest? 2) Why didn't Jesus flee the arrest, like he had so many times before? 3) Is it possible to love your enemy? Hey there! I'm glad you joined me for another lesson. We're looking at situations occurring before Jesus' crucifixion. The loftiest standards of love will be unveiled during Jesus' arrest. Let's find out what Jesus commands his followers to practice in their lives. Jesus' arrest could only be vaguely pictured by the disciples beforehand, because Jesus read them a prophecy about his arrest from Zechariah 13:7, "'Awake, O sword, against my Shepherd, the man who is my partner,' says the LORD of Heaven's Armies. 'Strike down the shepherd, and the sheep will be scattered.'" This Scripture passage predicted Jesus' arrest and the scattering of his apostles. This isn't to say anything bad about the apostle's commitment to the Lord, but that God wanted the apostles scattered and hidden for a time, so they could stay safe from harm in order to start building his Church. Judas Iscariot had departed from Jesus' Last Supper hours earlier to plot Jesus' arrest with the Sanhedrin. 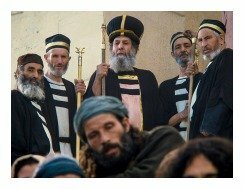 The Sanhedrin was the Jewish governing body made up of Sadducees and Pharisees - the religious leaders of Judaism. These leaders wanted Jesus crucified because they perceived him as a threat to their established religion, which in fact he was! Their "official" reasoning, however, was that Jesus' popularity would explode and the entire nation would follow him. That situation would lead to Rome becoming suspicious of Israel and thereby discerning the need to destroy the nation. Fear of this scenario led the Sanhedrin to want to sacrifice one man, Jesus, in order that the Jewish religion survive the threat of the Roman government. In other words, they believed Jesus could die for them, and save BOTH the Temple and the Hebrew nation (John 11:45-57). In reality, the Sanhedrin were mostly worried about protecting their religion and thusly their jobs, power and prestige. Jesus of Nazareth was a potential threat. They knew he was a miracle worker like Moses and Elijah. He even raised people from the dead! They knew his teaching was far greater and more popular than any of their own teachers. Jesus baffled most and excited many while teaching in and around Jerusalem. The Sanhedrin, in their envy, wanted him dead, not just dead, but crucified and dead. 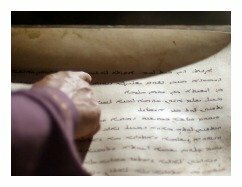 Jesus had constantly slipped through the hands of the Jewish leaders - they were unable to seize him. The Sanhedrin finally found a willing partner in Jesus' disciple, Judas Iscariot. Judas would betray his Master and his whereabouts, leading the guards to his location and Jesus' arrest. They knew they had Jesus cornered this time! They gave Judas 30 pieces of silver for his valuable information. This payment was blood-money. 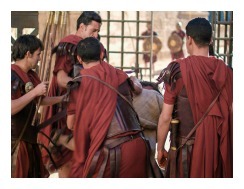 The temple guard and the Roman soldiers were gathered and equipped with weaponry. Judas, under the possession of Satan himself (John 13:27), proudly led the way to Jesus. Many others followed Judas and the angry mob on their way through the streets. They were fully expecting a battle to ensue. Meanwhile, Jesus and his apostles arrived at their normal meeting place in the olive grove. They knew what was transpiring, when suddenly they saw the flickering lights approaching. Jesus and his disciples had prepared for this moment through prayer. The Father strengthened them for this ugly moment in Jesus' life. Jesus on the cross was drawing near. Here came Judas, saying, "Greetings, Rabbi!" Judas' kiss of betrayal then set the wheels in motion for Jesus' arrest. Jesus asked him, "Why have you come, Friend?" Jesus really knew why they came, but he wanted Judas to verbalize his betrayal. No reply came, so Jesus asked, "Who are you looking for?" They told him they wanted to arrest Jesus the Nazarene. Jesus thundered, "I AM HE!" The power of God swept from Jesus' voice like a strong gust of wind, knocking every member of the mob onto their backs! This phenomenon is a little known amazing fact of Jesus' arrest. The mob members collected themselves and staggered back up to their feet. Jesus asked the stunned guards again, "Who are you looking for?" They sheepishly replied "Jesus of Nazareth." This time Jesus gently stated, "I told you that I am He. Now, let these others go." The guards then shackled Jesus Christ with heavy iron chains. The disciples were in disbelief at this point. Peter felt compelled to attack the nearest guard, so he swung his sword to cut off a servant's head, but sliced off his ear. The person Peter attacked was Malchus, a servant of the high priest, Caiaphas. Jesus, calm and controlled, told Peter to place the sword back into it's sheath, saying, "Those who use the sword will die by the sword. Shall I not drink from the cup of suffering the Father has given me?" (John 18:11). Jesus was following his Father's grand plan of redemption and had no need to fight, nor even escape. Jesus was the Lamb of God being led to slaughter. The true Kingdom of God has never, nor will ever, advance through physical force. Physical warfare has NO place in God's plan of salvation. Neither can any of us compel other souls to accept Jesus and his word. We can plead with people, but we can't force or even fool people to repent and accept Jesus as their Savior. God changes hearts, so they can respond to his Word, which we share with them. The Kingdom of God is built on the supernatural power of God, not on human force or persuasion. Back to Jesus' arrest, where he is now handcuffed and captive. There is Malchus, bent over on his knees in shock after being stunned by Peter's sword. There laid his severed ear on the ground. Blood poured over his shoulder into his hands. Jesus compassionately whispered, "There will be no more of this [violence]." He touched Malchus' ear and perfectly healed him. I LOVE the portrayal of this beautiful moment in Mel Gibson's "The Passion of the Christ" movie. This is a touching scene where the Captive lovingly heals a severe flesh wound of his captor (Luke 22:51). No where else in the Scriptures does Jesus heal an injury such as this. We have an amazing Lord Jesus, who truly loves his enemies. Can you and I do such a marvelous thing as Jesus did with Malchus? We can't instantly heal a person's wound, but why can't we do something less spectacular? Would we reach out and do a kind deed to someone who is hurting us in some way? We are called to do this very act of loving kindness to those who hate us most. Jesus said, "Love your enemy! Do good to them...Then your reward from heaven will be very great, and you will truly be acting as children of the Most High, for he is kind to those who are unthankful and wicked. You must be compassionate, just as your Father is compassionate." When you love your enemy, your love is heightened for God and your relationship with him flourishes. This is a very serious message to those who love the Lord. Our life is a testing ground for our faith, this command being a high level of test. We should seek out opportunities to love our enemies. Many false gods are polar opposites of Jesus. For instance, Mohammed, the prophet of Allah, uses guns and the sword to conquer both people and nations. Some Christian rulers over the centuries have been misguided with their religious zeal, as well, but they weren't abiding by God's will. Don't ever let someone tell you that Christianity led to such things as the Inquisitions and Crusades. Please inform them that the decisions going into these acts were not based upon Scripture. We have to be careful not to mix the Kingdom of God with earthly kingdoms because they are very different entities. One is spiritual and one is physical. One is ruled by God in heaven, the other ruled by simple humans. Don't confuse Christianity with nationalism (aka patriotism). Always remember to love your enemies. You can start by praying for them. What are you waiting for? Jesus requested that the captors let his disciples go, but apparently they attempted to capture the disciples, too. Jesus' disciples fled, scattering in different directions. This escape fulfilled the Zechariah 13:7 prophecy. The disciples were fearful of what could happen, since they weren't privy to what lie ahead, as Jesus was. In a rush, they escaped the danger. Mark says he escaped in an interesting way, to say the least. He was a late addition to the disciples' meeting, only having a robe draped over his naked body. He was grabbed by a guard, but escaped naked after giving up his robe and fleeing (Mark 14:50-52). Peter and John later doubled back and followed the mob from a safe distance. The other disciples disappeared into the night, not being heard from again until after Jesus' resurrection. Jesus' arrest was illegal. 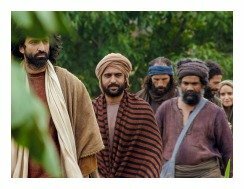 Jesus exposed the Sanhedrin and participating Roman guards, by pointing this fact out, "Then Jesus spoke to the leading priests, the captains of the Temple guard, and the elders who had come for him. “Am I some dangerous revolutionary,” he asked, “that you come with swords and clubs to arrest me? Why didn’t you arrest me in the Temple? I was there every day. But this is your moment, the time when the power of darkness reigns.” (Luke 22:52-53). First of all, Jesus exposed Satan as the mastermind behind this entire plot. The earth is ruled by Satan, and Jesus was on his battleground. The reason for Jesus' arrest being illegal is that the laws of the Sanhedrin state that there can be no steps of legal action taken after sunset - it was expressly prohibited. This fact places Jesus' arrest as a crime against him. Consider it similar to police authorities barging into your home without a search warrant. The Sanhedrin, as usual, found reason to break their own laws, again exposing themselves as the hypocrites they truly were. "The Passion of the Christ" movie showed Jesus being mocked and beaten on the way to the offices of the former High Priest, Annas (John 18:13). They eventually went to the house of Caiaphas. Scripturally, however, beatings of Jesus during his arrest can only be assumed. 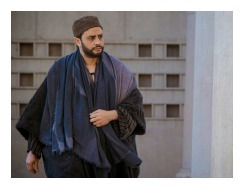 No where does it state the captors were abusing him on the way to his trial. I would think these guards handled Jesus with slight trepidation. Moments before, they had been blown backwards by the force of Jesus' words! Then they watched him perform the miracle healing of Malchus. They had to be in awe of this amazingly composed Prophet. Remembering back in Scriptures, these same men had attempted to arrest Jesus, but being amazed at his teachings so much, they forgot to arrest him! (John 7:45-46). That wasn't going to happen again, though. Jesus was always accompanied by his Father (John 16:32), never being alone as the scene seems to indicate. Also, in order to protect God's plan of redemption, Jesus could have easily called on a multitude of angels to protect the plan (Matthew 26:53). They weren't needed. Jesus was allowing himself to be arrested (John 10:18), moving through the legal processes and onto the cross. The plan was being accomplished one step at a time. You'll observe here, lesson after lesson, the steps that went into Jesus' sacrifice for you. Be in awe of your God and his Son. They are worthy to be followed by you. Please consider becoming Jesus Christ's disciple, devoting your heart to him forever. 1) Is the command to "Love thy enemy" truly possible? Would God ever give us a command that was unattainable? 2) Jesus prayed in the Garden for the Father's will to be done. He was arrested soon after in the olive grove. What does that reveal to you about God's will? 3) Christianity often gets a bad reputation for being aggressive in it's growth. Where can the line be drawn between aggressive and proper evangelism and growth? What would I do if I was arrested for your holy name? or would I sneer at them? or would I plan an escape? or would I curse at them? After sharing this Bible study lesson on Facebook or Twitter below download your FREE printable Bible Study Lessons (pdf version): Jesus' Arrest, Lesson 3.06. Please Donate To GG.com! Special Note: I'm grateful to Big Book Media & Free Bible Images, Stock Exchange, Morgue Files, and Stock Photos For Free for the use of their photos for Jesus' Arrest Bible study lesson.